I finally got to the library the other day. I got two books on German history, a book on the airline industry and Seeing In The Dark, by Timothy Ferris. I thought I had read it before, but I took it home anyway. After I got into a bit, I started remembering the stories of how amateur astronomers have contributed to humankind’s knowledge of the cosmos. The subtitle is How Backyard Stargazers Are Probing Deep Space and Guarding Earth from Interplanetary Peril. Ferris tells of his visits to a number of pretty much regular folks who like to look through telescopes on their own time. Each one has a special interest that he or she has parlayed into some notoriety amongst the sky-viewing cognoscenti. Interspersed with those stories are concise lessons on our current understanding of various astronomic objects. It’s interesting. Suddenly the sky collapsed into darkness and a dozen bright stars appeared. In their midst hung an awful, black ball, rimmed in ruby red and surrounded by the doomsday glow of the gray corona. No photograph can do justice to this appalling sight: The dynamic range from bright to dark is too great, and the colors are literally unearthly. I had a copy of Ferris’ The Whole Shebang, but I went in to look for it just now and it isn’t there. I guess I’ve loaned it to someone and I’ll probably never get it back. It had a great chapter about the existence of God. I do have another one by Ferris called The Mind’s Sky that I found used. It’s OK, but it didn’t grab me like The Whole Shebang did. Speaking of the Sun, I was headed to work today about 7:15 am. The Sun rises late over Pacifica so I wasn’t surprised at the gray morning light. I put my headlights on. 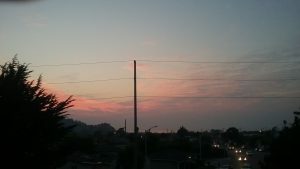 What did surprise me was the Sun well over the horizon when I came up over the hill in Daly City. It was blood red and baleful through the smoke that has lain over the Bay Area for two days now. As I write this, the Sun has gone down, but it’s doing a nice job of lighting up the few wispy clouds in the western sky. Not high art, perhaps, but hopefully a harbinger of cooling breezes by tomorrow. There were no clouds of any kind yesterday. It’s been over 100º F in San Francisco the last two days. Out here on the coast where it’s usually much cooler, it was over 90 in my apartment when I got home. With the front door open and the fan blowing at maximum for the last two hours, it’s down to 88. Outside it’s 85. No one in Pacifica has air conditioning.